Uncle Val’s Restorative Gin features a relatively light botanical bill features a pair of botanicals— rose and cucumber— that rose to fame in one of the contemporary style’s forefathers, Hendrick’s. All of Uncle Val’s Gins are distilled from a base of grain at an unspecified distillery in Bend, Oregon. There’s no guess from me, as there are several distilleries in Bend. They are currently all housed under the “3 Badge Beverage” brand name, formerly known as 35 Maple Street Distillery out of Sonoma, CA. Restorative Gin’s nose begins with sugared strawberries, rose and peach with a hint of cucumber, coriander and juniper underneath. That floral character is intense here. But the palate is more clearly gin. Piney juniper almost sings at first sip. It’s vibrant and fresh. Rose hits in the middle. It is a bit more floral, but also with a sweet lime zest edge. 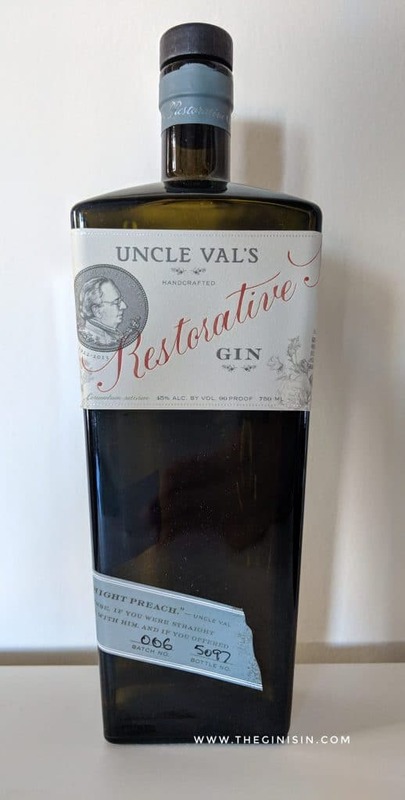 Uncle Val’s Restorative Gin closes with a moderate amount of coriander, while the finish is moderately long with vegetal juniper notes— and a farirly good bit of warmth as well. As a point of contrast, I think Hendrick’s has a lot more spice character and a less obvious nose. Both are extremely well-balanced. Neat, it’s easy to recommend Restorative Gin to fans of Hendrick’s Gin, Beehive’s Jackrabbit Gin, or Nolet Silver. Uncle Val’s Restorative Gin is a surprisingly versatile mixing gin. The floral, fruity notes come off on the nose in a Gin and Tonic, while the body is more traditionally juniper-forward. The Martini plays well to the gin’s bright aromatic profile— but adding a twist similarly teases forth the citrus hues, despite there being no citrus among Uncle Val’s botanical bill. In short, there’s few cocktails that it doesn’t work in. Moreover, it’s so distinctive that it’s unlikely to be confused for anything else in the drink. More than just a Hendrick’s wannabe, Uncle Val’s Restorative Gin nicely combines a simple botanical bill into something vastly more complex. Classic gin fans will appreciate the juniper forwardness on the palate, while fans of contemporary style gins will love the beautiful way rose and cucumber blossom into notes of berry, lime, and peach. Overall, Restorative Gin is a fun gin that is worth seeking out.